New York is a funny place in that it, at once, holds out such promise and possibilities for the future, and in the obverse, harkens one to the good, old days. Well, as someone who has lived in Manhattan for all of my almost 59 years, I clearly remember the “good old days” as not being as good as the cliché implies. In current times, for me, despite my usual kvetching about the weather, traffic and subways, etc., every day in New York is a Shangri La experience. I find that many newcomers to this great metropolis take for granted the city’s ability to make itself run, to help us all get along, to transport us many miles through its diverse neighborhoods, to provide recreational activities, and most of all to thrive and prosper. For all of you who are not from New York and/or not of a certain age, I feel it vitally important that you have some baseline notion of what a true mess this city was for the fifty years leading up to the present day. Back in the 60s, the city was plagued by strikes, a blackout, rampant crime, race riots, corruption, police brutality and all manner of municipal dysfunction. I clearly remember that the Harlem riots of 1964, which were precipitated by a charge of police brutality, held the city in a grip of absolute terror. For days, any non-African American who drove near or around Harlem or other black neighborhoods was at risk of being set upon by angry mobs. While there had been other Harlem riots in the 30s and 40s, this was the precursor to the racial seething which eventually led to further explosions of street violence in the 70’s, 80s and even the 90s. 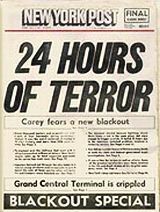 For example, in 1977, as a result of a major blackout, many of the city’s black neighborhoods, especially those in Brooklyn, erupted in chaos, with many local businesses being gutted to the very walls. In the 80s, a gang from Brooklyn’s Bensonhurst hunted down a black teenager to his death by gunfire. In 1991, in Crown Heights, Brooklyn, a motorcade of Hasidim accidently struck and killed a black child, thereby leading to further rioting, which culminated in the gang murder stabbing of an innocent rabbinical student. Needless to say, this sophisticated and cosmopolitan city was not much of a melting pot. Strikes, both municipal and private sector, were a way of life in this town. The first was a 1966, 12-day transit strike which served as both a perverse model for future municipal strikes and a stoker for the growing enmity between municipal labor unions and the feckless city. In 1980, a second transit strike hit the city, and the Transit Authority’s graffiti covered subway cars lay dormant for another 12 days. I recall the subways being so revolting then that I would steel myself, as I would for a spinal tap, upon my entering. Many of the cars were so graffiti scarred, with the windows painted over, that determining one’s subway stop was a virtual impossibility. I vividly remember the constant cadre of panhandlers who would aggressively fight their way through the subway cars, and, of course, their street level counterparts, the “windshield squeegie men,” who would hold up traffic only to add another layer of grease to your already opaque windshield. One early Saturday morning, I entered the presumably vacant, last car of the number 4 Train, only to be screamed at by a homeless family which had taken up residence there. I was greeted with words to the effect that I was violating their space and committing some kind of Constitutional equivalent of home invasion. During this period, I remember the appalling “open sewer” smell of the subways and their stations, on which I personally witnessed two incidents of people publicly relieving themselves – and one was a woman! During the late 70’s and early 80’s, the subways and city had become virtually lawless. During the transit strike of 1980, resourceful subway muggers began taking their trade to the street level where taxi cabs, packed with ride sharers, were subject to hold ups. Crime was rampant back then, and the city was deemed by many to be ungovernable. In fact, at a public appearance in the late 1970’s, actress Shirley MacLaine, declared New York to be “the Karen Ann Quinlan of American cities.” Sadly, our elected officials governed from the position of holding-the-line and not making things worse. Improving the quality of life took a back seat to damage control. I remember the police department’s experiment which, in order to compensate for its reduced ranks arising from brink-of-bankruptcy budget cuts, called for the parking of empty squad cars overnight in the city’s most crime ridden areas. The motive was to maintain some semblance of police presence, albeit by way of a vacant vehicle, as a deterrent to crime. While this worked for about a week or so, the crime rate in these areas actually increased, and now came to include the stripping for parts of city-owned vehicles. As a further illustration of the city’s ungovernability, I remember the DO NOT SHOOT dictates of then-Mayor Lindsay of Fun City fame, whose tenure was wracked by a spate of riots and looting. Taking this mandate to the extreme, the hamstrung police force allowed the looters to do their thing. Possessions, the mayor claimed, were not worth lives. This was evidenced by a front page photo on one of the tabloids of a frustrated police man holding up traffic for a looter carrying his new color TV set. One of the most outrageous “quality of life” crimes occurred in April of 1989, when a 28 year old investment banker was viciously raped and beaten to within an inch of her life while jogging in Central Park in the daylight. Forever known as “the Central Park jogger”, this unfortunate woman was the subject of the thuggish practice of “wilding” in which groups of young men wreaked havoc and violence upon anything in their path. The city, and, for that matter, the entire country was aghast at such savagery, especially in a city which had shown some hint of promise for a turnaround. One year later, during the annual Puerto Rican Day parade in June, another wilding attack in Central Park saw several women being involuntarily fondled and partially undressed to the delight of jubilant gangs of screaming youths. Most of the attack was recorded on video, and played nightly by the local and national news to the outrage and dismay of the entire country. At the cusp of the 21st Century, Fun City, as Mayor Lindsay called New York, 25 years earlier, had not yet shed its lawless mantle. In the mid-1980’s, the chaos of crime had reached comical proportions. I remember reading the account of an Upper West Side resident, who, after years of having had so many of his late model cars broken into, finally threw in the towel and purchased a jalopy of a car which he parked in the street nightly, subject to alternate side of the street parking rules. Wise to the fact that most burglars gain entry by breaking the windows, the car owner decided to post a “NO RADIO” sign on his windshield (a common practice, then, of car owners) , as well as a notice that the doors were unlocked. To further kill his tormentors with kindness, he left the keys to the ignition in the glove compartment. To his astonishment, several weeks had gone by without incident, except for the fact during his daily start-ups, the odor of cigarettes permeated the air. Sometime later, to his further surprise, he found in the glove compartment a small transistor radio which was tuned to the Spanish language station. It was only then he realized that someone was taking up overnight residence in his car. He deduced that the car was protected from break-ins by virtue of the presence of this chain-smoking squatter. Fearing to upset the apple cart, he welcomed this anonymous, guest by regularly leaving him sandwiches and all sorts of snacks and drinks. After all, it was cheaper than repairing or buying a new car. As time went on, he noticed that the smell of cigarettes had lessened, and the secreted transistor radio was gone. With no one to stand sentry over his wheels, this benevolent yet hapless victim soon suffered a fate all too familiar to his New York contemporaries – his car was stolen. Born and raised on Manhattan's Lower East Side, where Little Italy melts into Chinatown, I, with short living stints outside the city, have been domiciled in New York for my entire life. Having had a longstanding love-hate affair with New York by reason of having endured through some of its darkest days, I have now come to love my hometown unconditionally. As the owner and operator of A.L.Piccolo & co., Inc. a turnaround/management consulting firm since 1988, I service clients world-wide from my offices in midtown Manhattan. Married for the second time, I am the father of two "bona fide New Yorkers" from my prior marriage. Their ravings and rantings of what is hot or not, keeps me current in matters metropolitan. I love writing for BANY because it allows someone of my advanced vintage to fill in the historical blanks of this great city. Also, it allows me to insinuate a "senior's" point of view on where the city is heading, simply because I know from whence it came. Well done, Lou. I have two incidents i would like to add from the seventies. One time somebody broke into my car and cut the glove box compartment from the bottom even though it was unlocked. Needless to say, there was nothing there except for a 50 cent comb. Another time, I came home late one evening and found my car gone! i reported the missing car to the police but next morning it was back! Some kids must have found a key that worked and were borrowing it for joy rides. enjoyed thoroughly – – very informative, historical account of this great city we call home. loved your article, hope you have more of the same in the pipeline.